Meet the first 100% electric ferry in Norway, the “Ampere”, who’s developers boast that it has cut emissions by 95% and costs by 80% compared to traditional fuel-powered ferries since its launch in the spring of 2015. With the aim of reducing harmful emissions and noise pollution, the “Ampere” is the result of a dedicated partnership between Norled AS, Fjellstrand Shipyard, Siemens AS, and Corvus Energy. The vessel operates on a 3.5 mile crossing and makes approximately 34 trips a day, each trip requiring approximately 20 minutes. The success of this first vessel helped springboard the commission of another vessel that took its maiden voyage last summer. The ferry is designed as an aluminum catamaran to reduce weight and the vessel makes use of LED lighting, solar panels and a heating, ventilation and air conditioning (HVAC) system with a heat recovery system are featured onboard for low-energy consumption. Electric instant water heaters are also featured onboard. The electric ferry annually offsets over 250,000 gallons of diesel that a conventional ferry on the same route would use. The developers announced the tremendous reduction in costs and emissions, which surpassed their anticipations, at the Nordic EV summit last week. 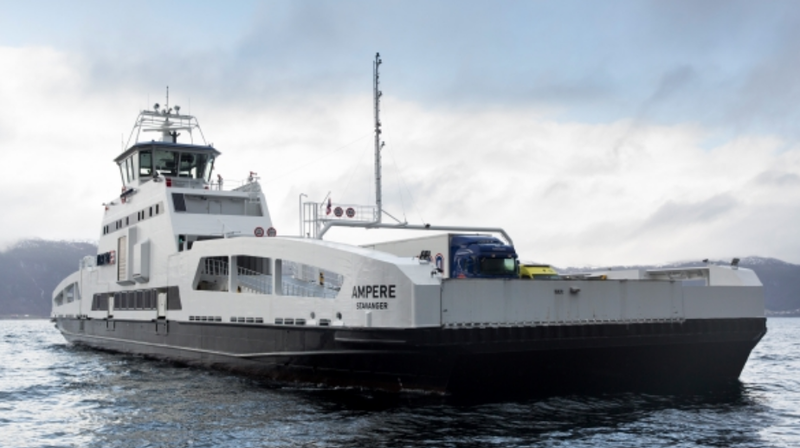 As a result, of announcing the tremendous reduction in costs and emissions at the Nordic EV summit last week, the developers are reporting a backlog of 53 additional ferries.